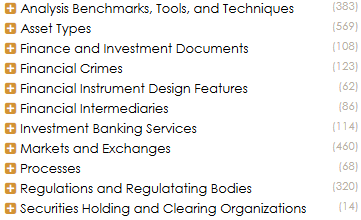 We have recently updated, and expanded, our WAND Finance and Investment Taxonomy. There are the incremental updates that you would expect to find along with some rather large additions to complete the area of Investment Banking. We have included Investment Banking Services and terms relating to Front Office, Middle Office and Back Office Services. We have also added a section of Financial Instrument Design Features as well as a section of Finance and Investment Documents. We've also add processes that go into Equities and Sales Trading, IPOs, Mergers and Acquisitions, and Underwriting that are also important to Finance and Investment Firms. The areas of Financial Intermediaries, Markets and Exchanges, Asset Valuation Methods, Benchmark Interest Rates, and Asset Types have all been updated. You'll still find Financial Crimes in this taxonomy along with Regulations and Regulating Bodies. We have added a new Securities Holding and Clearing Organizations section. The WAND Finance and Investment Taxonomy can be customized to include specific terms to meet the needs of any Investment Firm. As with all WAND Taxonomies, the WAND Finance and Investment Taxonomy is available by itself or as part of the WAND Taxonomy Library Portal.